control of the food-supply => implementing a global digital currency? without transparency – crime will always pay(off) in an (death)economy – how can we make it expensive to be an criminal? Every kid a laptop – jobs shipped to China – US-middle-class is toast – gov says no – instead of every kid get’s a laptop – we are going to have a housing-bubble – instead of building new skills we gonna build bigger houses – while everybody is building bigger houses and watching TV – we gonna quietly move all the money out of the country – and when it is all set and done – it will be too late – because they will instead of having less debt more debt – they will have fewer small businesses – so we gonna have a party and nobody notice – by the time they notice it will be too late. The average US family was encouraged to take mortgage-debt, auto-debt, credit-card-debt that in many respects did not know they could not afford. The amazing thing: Governments and Banks knew that they could not afford it. In another words: They encouraged them to take this debt – knowing – that the policies would be engineered that caused their incomes to fall later on. Man with family two kids – software developer – you feel like you are doing very well. A hole things are going on behind the scenes – you are going to loose your job in 3-5 years – this is statistically very probable – you don’t know that – but the financial institutions are knowing that. The banks don’t tell you what they know about your financial situation – here – have more debt that you can not repay – thanks – we take your house. the vast majority of mortgages were done after 1996 – were fraudulent induced. The reality is – our pension funds own them – so we just sold our fraudulent induced mortgages into the pensions funds – and if we can not pay of those mortgages – guess what happens with our retirement-savings. “if you walk into Washington what do you see? 21 agencies? “Black details the ongoing business relationship between Watson’s IBM and the emerging German regime headed by Adolf Hitler and his National Socialist German Workers Party (NSDAP). Hitler came to power in January 1933; on March 20 of that same year he established a concentration camp for political prisoners in the Bavarian town of Dachau, just outside the city of Munich. Repression against political opponents and the country’s substantial ethnic Jewish population began at once. By April 1933, some 60,000 had been imprisoned. 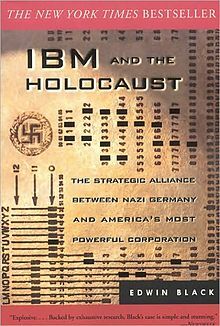 Business relations between IBM and the Hitler regime continued uninterrupted in the face of broad international calls for an economic boycott. Indeed, Willy Heidinger, who remained in control of Dehomag, the 90%-owned German subsidiary of IBM, was an enthusiastic supporter of the Hitler regime. Fitts has a BA from the University of Pennsylvania, an MBA from the Wharton School and studied Mandarin at the Chinese University of Hong Kong. What’s HUD Got to Do with It? From the NSC’s Point of View: What Does HUD Have to Do With It? Over the course of several years my company Hamilton Securities and I were subjected to a government investigation that ultimately resulted in the destruction of Hamilton and the loss of my personal fortune. This spring the government finally dropped its investigation, having failed to find or establish any evidence of wrongdoing at Hamilton or by me. This was not a surprising result, because there was none to find. Nevertheless, over the course of five years and at a cost of millions of taxpayers’ dollars, Hamilton and I were harassed into financial oblivion. Why? It started in 1996 — at the same time that the San Jose Mercury News was preparing a story exposing the US government’s marketing of crack cocaine into South Central Los Angeles in the 1980’s. The year before Hamilton Securities had launched a company in the inner city to provide data servicing for our software tool, Community Wizard. The Wizard used geographic information systems software (GIS) to map the geographic patterns of government investment, including defaulted mortgage loans of the Department of Housing and Urban Development (HUD). At that time we put three maps up on the Internet site for a place-based survey for the HUD loan sales. They showed defaulted HUD mortgages in New Orleans, the District of Columbia and South Central Los Angeles. High and expensive rates of HUD mortgage defaults coincided with areas of heavy narcotics trafficking in South Central LA. It seemed understandable that someone might want the Wizard team to be otherwise occupied when the San Jose Mercury News published the “Dark Alliance” series regarding the Iran-Contra drug dealing in South Central Los Angeles. Otherwise we might notice the suspicious patterns that exist between HUD defaulted mortgages and government sponsored narcotics trafficking. After initial efforts to shut us down failed, a team of investigators working for the Department of Justice (DOJ) seized our office and destroyed our software tools and databases. If Wizard and supporting databases had not been stolen or ordered wiped clean from our computers, it would have linked national housing data to local housing data. It would have linked the databases on local housing down to the street address and local mortgage originations to the data on pools of housing tax-exempt bond and mortgage securities whose credit was backstopped by FHA and Ginnie Mae at HUD. Wizard may have revealed that allegations that some US-guaranteed mortgage securities were fraudulently issued and were illegally draining HUD’s reserves merited serious investigation. Was it possible that the US Treasury and the Office of Management and Budget (OMB) were operating HUD as a slush fund to illegally finance black budget operations? The possible securities fraud implications would be without precedent. Were covert operations and political graft the political raison d’être for HUD’s existence? The targeting of Hamilton and Fitts stopped in 2001. The final attempt to frame me was closed after 18 audits and investigations and a smear campaign that reached into every aspect of my professional and personal life. Years of hard evidence as to the baselessness of the government’s goals and the criminality of its conduct had been ignored. The corruption of the courts, lawyers and the Department of Justice had become painfully visible, then predictable, then comical. The flood of federal credit, subsidies and contracts bought off everyone around us and showed what happens when human greed and the need for safety mixes with cheap money. Several things helped to finally bring relief. In 2000, we began to put all documentation on a website (www.solari.com) thus creating a pool of evidence freely available to reporters, editors and readers. A second factor was that a great deal of money was unaccounted for from the US Treasury. This now totals over $3.3 trillion based on General Accounting Office (GAO) reports. The notion that the US Treasury, OMB and DOJ might be capable of significant fraud was gaining credibility in the investment community. A handful of courageous reporters published stories about what was happening. However, in a deeper sense, the targeting started long ago when narcotics trafficking and HUD fraud destroyed the Philadelphia neighbourhood where I grew up. It was then, as a young person, that I learned that the law was a tool of coercion — that there was no rule of law. It is a terrible truth. As a white, Anglo-Saxon protestant I had been counting on the rule of law to protect me. I found, instead, that it is a powerful myth, which has fuelled great wealth for those who run and rule the economy — both legal and illegal. The rule of law is the basis of liquidity. That is why so much time and money goes into sustaining the myth. Capital gains are highest for those who can combine liquidity, the value creation of stock price multiples, and the power of new technology with the high margins of narcotics trafficking, financial fraud and control of the Congress, the courts and the enforcement agencies to create and protect markets. Transaction costs rise and market multiples fall as the myth deteriorates. The destruction of Hamilton Securities is a case study in the disintegration of the myth of the rule of law. As that disintegration debases the treasuries and currencies of nations and destroys the equity of communities, it is making its way to your door one way or another. Why Target Hamilton Securities? For years rumours circulated that the National Security Council was managing narcotics trafficking directly from the White House under the direction of Oliver North and Vice President George Bush as part of an operation that came to be known as Iran-Contra. The story never seemed to catch on. It was unthinkable to most Americans that the White House was marketing drugs wholesale to be retailed to their children in order to pursue a foreign policy objective. No major media business could carry the story if it meant all the drug money pulled out of their stock. A sell off like that could kill a business over night. The truth is that the inability of America to come to grips with the Iran-Contra disclosures about narcotics trafficking by the US government indicated the extent to which our economy had become addicted to drug profits. A note from our founder on Iran-Contra In the mid 80s two covert operations of the American government overseen by the National Security Council of the Reagan administration and sanctioned by the highest levels of political authority were exposed. These were the illegal sale of weapons to Iran and the provision of convert aid to the Contra insurgency in Nicaragua in violation of a Congressional vote banning such aid. An independent counsel was appointed to investigate the matter. The investigation resulted in no fewer than fourteen individuals being indicted or convicted of crimes. These included senior members of the National Security Council, the Secretary of Defence, the head of covert operations of the CIA and others. After George Bush was elected president in 1988, he pardoned six of these men. The independent counsel’s investigation concluded that a systematic cover-up had been orchestrated to protect the president and the vice president. The sheer breadth of the covert operations was stunning. Indeed, it involved not only arms sales to Iran but also the solicitation of funds from third party governments as well as from wealthy Americans to pursue a foreign policy agenda in Central America that was not only controversial but illegal. During the course of the independent counsel’s investigation, persistent rumours arose that the administration had sanctioned drug trafficking as well as a source of operational funding. These charges were successfully deflected with respect to the independent counsel’s investigation, but did not go away. They were examined separately by a Congressional committee chaired by Senator John Kerry, which established that the Contras had indeed been involved in drug trafficking and that elements of the US government had been aware of it. It was not until Gary Webb’s Dark Alliance expos originally published in the San Jose Mercury News that the government’s links to drug trafficking in the United States became established beyond a reasonable doubt. This in itself is curious, because Webb was hardly the first investigator to document the links between American intelligence and narcotics. Alfred McCoy, writing in the 70s, had documented the involvement of the CIA and the military in heroin and opium trafficking in Southeast Asia. Indeed, narcotics had been a source of covert funding and political leverage for years, extending at least as far back as the invasion of Sicily during World War Two. In retrospect, what was so startling about Iran-Contra was the scale of the financing operations involved, which reached even into the American banking system and included various forms of financial fraud. This gave the operation a link to the scandals that enveloped the savings and loan industry in the late 80s. Most observers do not connect these apparently diverse events when in fact they are part of a whole. The Clintons’ rise to the White House was fuelled by the Iran Contra operations in Arkansas. The drugs and arms transhipment point in Mena Arkansas had allegedly been one of the most significant operations operating under the aegis of the NSC’s Oliver North. Some said that as much as $100MM a month of arms and drugs flowed through the airport at Mena Arkansas. The stories and lore — whether about the goings on or the deaths of the many people who tried to stop or expose them — took up thousands of pages on the Internet but never seemed to work their way into the “official reality” of national TV and newspapers. When the Clintons arrived in Washington there were numerous efforts to investigate government narcotics trafficking and fraud. Sally Denton and Roger Morris probably got the closest. Their article on Mena was pulled by the Washington Post at the very last minute, eventually to run in Penthouse in the summer of 1995. But the journalist who finally broke through the nation’s mass denial was Gary Webb. And he made it through thanks to the Internet — a medium much harder to control than the broadcast or printed press. In August of 1996, the San Jose Mercury News broke Webb’s story of illegal narcotics dealing by the US government, targeting South Central LA with crack cocaine. The story was told from the point of view of Ricky Ross, the legendary dealer who built the market in South Central. And what an incredible story it was. While the San Jose Mercury News was not a big deal inside the Washington beltway and in New York media circles, it was a very big deal to the new markets growing up on-line. It was known as having the finest website of any newspaper on the World Wide Web. Its location in Silicon Valley meant that the techies read it and took it seriously. When the News broke the story in mid-August, the story was serialised in a relatively short form, as news has to be. What was different was that the News website crew took the time to scan in thousands of pages of supporting legal documents available to read or download from its website. By the time the various intelligence agencies and major media centres had organised and succeeded in shutting down the story and getting Gary Webb transferred and then essentially fired, a rich network of alternative and minority radio stations and internet news sites had downloaded the documents and covered the story. All the kings’ horses and all the kings’ men could not put Humpty Dumpty back together again. Thousands of Americans had copies of the original documentation. The evidence was hard. The allegations were true. The story was now out of the control of the official reality cops. The Internet created a vehicle that was helping America come to understand that one of the most profitable businesses in America might not be run by black teenagers and Colombian warlords, but by representatives of their own government. America wanted the Dow Jones up, and Hamilton Securities’ Community Wizard threatened to provide a hard link between Gary Webb’s exposure of American intelligence’s narcotics trafficking connections and money laundering. In the corridors of power, there was no contest. The Dow Jones won. One day I was a wealthy entrepreneur with a beautiful home, a successful business and money in the bank. I had been a partner and member of the board of directors of the Wall Street firm of Dillon Read, and an Assistant Secretary of Housing during the Bush Administration. I had been invited to serve as a governor of the Federal Reserve Board and, instead, started my own company in Washington, The Hamilton Securities Group. Thanks to our leadership in digital technology, financial software and analytics, Hamilton was doing well and poised for significant financial growth. The next day I was hunted, living through 18 audits and investigations and a smear campaign directed not just at me but also members of my family, colleagues and friends who helped me. I believe that the smear campaign originated at the highest levels. For more than two years I lived through serious physical harassment and surveillance. This included burglary, stalking, having houseguests followed and dead animals left on the doormat. The hardest part was the necessity of keeping quiet lest it cost me more support or harm my credibility. Most people simply do not believe that such things are possible in America. They are. In 1999, I sold everything to pay what to date is approximately $6 million of costs. My estimate of equity destroyed, damages and opportunity costs is $250 million and rising. I moved to a system of living in four places on an unpredictable schedule in the hope that this would push up the cost of surveillance and harassment and so dissuade my tormentors from following. One of my new homes is a small first floor apartment in a row house on 54th Street in the West Philadelphia not far from the neighbourhood where I grew up. It was here as a child that I watched the financial disintegration begin. Another new home was in Hickory Valley in Hardeman County Tennessee, a small farming community where my father’s family has lived since the 1850’s. For several years, I have travelled back and forth by car between Philadelphia and Hickory Valley. Travelling has given me a different perspective on what I call the financial holocaust. It is not just billions of dollars of wholesale capital movements. It is not just defaulted HUD mortgages, US Treasury market interventions, Federal Reserve bailouts of hedge funds and IMF bailouts of Wall Street investors, money laundering out of Russia or narcotics trafficking. Now I see the signs of financial holocaust through the eyes of people who are being destroyed. Their currency is debased. Their children are targets of both “legal” and “illegal” drug trafficking and are condemned to learn in dumbed-down schools. Their small business equity is being extracted from under them. It is they who are carrying the burden of taxes without the benefits that government investment is supposed to provide. The cruel twist is that citizens are funding the financial ruin that is killing them and their children. Now I understand the process by which the rich get rich and the poor get exhausted. I see it through the eyes of the ladies who run the food marts; the farmers who can not cover their costs; the small town banker who makes character loans; the teenagers who deal and take the drugs; the mothers who try to stop the schools from forcing their kids to take Ritalin; and the small business people who try to make it through life honestly. They are overwhelmed by the sadness of what they see happening and do not understand. I used what I had learned about how the money worked to destroy Hamilton Securities Group to see how the money worked to destroy neighbourhoods and the people in them — one neighbourhood at a time. Families and neighbourhoods are the basic building blocks of the global economy. When the bubble bursts, all the key decisions must first be made there at ground zero. So that is where we shall start. How the Money Works: the Destruction of Neighbourhoods The model works about the same in every country, although the particulars vary between domestic and international agencies and the military and enforcement bureaucracies. Some call it the securitisation process. Some call it corporatisation. Some call it privatisation. Some call it globalisation. What this means in layman’s terms is that the management of resources is centralised. This is done through a system of securitisation based on privilege and coercion rather than performance and the rule of law. First, you consolidate all retail sales into a few large corporations, including franchise operations, cutting out local small business. Second, you outsource (“privatise”) all local government functions to a few large corporations or subject them to such an overwhelming amount of federal regulation that they can be controlled and managed for the benefit of a few large corporations and their investors. Third, you buy up all the land and real estate, or encumber them with mortgages in a way that is as profitable as possible and allows you to get control when you want it. Fourth, you finance the entire process with the profits from narcotics and organised crime that you market into the neighbourhood. This enables you to finance your expansion in a manner that lowers your cost of capital in a way that conveniently lowers the initial price of your investment and/or weakens your competition. I buy your business and land with your money at a fraction of the cost. No one sells her home faster and cheaper than a mother trying to make bail or pay a lawyer to save her family from jail or death. That is why narcotics trafficking is the ultimate form of neighbourhood leveraged buyout. Fifth, you leverage all of this with tax shelters, private tax-exempt bonds, municipal bonds, government guarantees, and government subsidies — all protected with complex securities arrangements. Sixth, you ensure that the only companies and mutual funds allowed meaningful access to capital are those run by syndicate-approved management teams. To raise significant campaign funds candidates for political office appoint syndicate-approved management teams. Investment syndicates define the boundaries of managed competition that cycle all capital back through their pipelines. That means the only local boys who can make good are those who play ball with the syndicate. In this way the private equity in a community can be extracted at a near infinite rate of return to investors and a highly negative rate of return to taxpayers. How the Money Works: Hardeman County, Tennessee My home in rural Tennessee shows the pattern well. A few years ago, about thirty small businesses shut down within six months after the new Wal Mart opened with the blessings of local government. The result within a year was that we transferred substantial equity and employment from local to corporate control without asking for a percentage of the equity to be created. Now a majority of our retail purchases produce not a dime of knowledge or equity for us. The knowledge of how to build and run retail businesses is leaving our workforce. We have no access to the data on how our retail money works locally. At about the same time, a national prison company based in Nashville, Correction Corporation of America (CCA) got the deal to build and operate two prisons down the road in Whiteville. Local and state government provided them with a package of zoning, infrastructure, contracts, tax-exempt bonds and assumption of risk that created lots of equity for CCA and its investors. Hardeman County, of course, got zero. After the deal was over, we had the risk, and they had the equity, although rumours abound about the local officials who got stock. A little later, a Tennessee paper reported that the former chairman of the Tennessee Republican state party sold his CCA stock for $17 million. Government, that is to say taxpayers, paid the ticket, and the private investors and management reaped the equity. The numbers on the prison deal help to explain the War on Drugs and welfare reform. The American people who make about $36,000 per year on average will not support paying $55,000 per year for a woman and her 1.8 children to live in HUD housing on welfare and food stamps. So the game of using HUD housing subsidies and tax shelters to warehouse people in communities can be extended only long enough to refinance the equity out of or gentrify investor’s current investments in HUD housing. The HUD development game is being replaced in part by a prison privatisation and development game that warehouses the same folks in prisons at a $154,000 all-in cost per person per year. The result is a rush of prison deals with government contracts, tax-exempt bond financing, and tax shelters combined with stock deals. Prisons have been sold to farming communities as “economic development.” In the meantime, corporations have consolidated control of seeds, agricultural biotech farming, food processing and distribution here and abroad. During the mid-90’s, you could see it beginning inside the beltway in Washington. Mandatory sentencing legislation or an announcement to sell government prison facilities on a negotiated basis generates significant capital gains immediately. Who wants to work hard in the real world when one can make quick up-front profits on their prison stocks? Drugs came to Hardeman County before I moved there. One of my friends is a farmer who said that she first noticed the drugs in 1986. Interesting. That coincides with activities at the airport in Mena, Arkansas — allegedly a significant drugs and arms transhipment point used during the Iran Contra operation. Mena is only a puddle jump away from our local airport in Bolivar, the county seat. It makes sense that with so much coming through Mena in the early 1980’s that the distribution routes would push into the surrounding states. Fifteen years on, we are overwhelmed. Should you pass the airport late at night, very likely you would see a private plane landing. When a private plane lands at a rural municipal airport at 4am on Sunday morning, it does make you wonder. This summer, we have had a major drug bust at a farm half a mile down the road, robberies, and high-speed convoys of sheriff’s cars with sirens wailing every day for the last few weeks. A man down the road could not get off crack and so, at the age of 30, drank a bottle of acid and died. Who is taking all these drugs? They say it is the kids. The only statistics that I can find indicate that marijuana is Tennessee’s largest cash crop — bigger than cotton and hardwood. This may be so, but where is it growing and who is growing it? The money-laundering situation fits the picture. If you travel by car enough you notice how many fast food restaurants and gas station food marts are far from doing the total retail necessary to support overhead and capital investment. One night I drove ten miles to Bolivar to go through the car wash at the local Amoco station. I tried to pay for a three-dollar car wash with quarters. I was told they would not take coins. It was a policy. Counting coins was too much work, explained two attendants as they chatted with friends, with no other customer but me. So I got back in my car and drove ten miles home and washed the car with a hose and some paper towels. The symbolic economy is too busy processing the proceeds of crime to do the work necessary in the real economy. Indeed, it makes you wonder, which one is the real economy? I don’t mean to say that Hickory Valley is not wonderful. It is. The land is beautiful; we have wonderful churches and more than a few fine neighbours. The reality is, however, that too many people are making money by destroying what we have. A note from our founder on PROMIS software… The significance of PROMIS software is that it was sold to banks, who wittingly or otherwise bought it with a trap door that allowed those with the requisite codes to get in. The software was allegedly developed in the 70s by a company called Inslaw. We say allegedly because there are those who believe that William and Nancy Hamilton, the owners of Inslaw, stole it themselves in the first place. The Hamiltons sued the government for stealing it. They charged that the government modified it to enable intelligence agencies to access bank records, accounts, and databases. The Promis affair is a difficult one to research, with much mis- or disinformation floating about. A reporter, Danny Casolaro who was investigating the story, was killed — officially ruled a suicide. Casolaro had, however, told friends that he was working on something dangerous and if he died he would have been murdered. While the PROMIS potential alone is worrysome, the fact that intelligence agencies might have a software entry to most of, if not all, the banks around the world, is truly sobering. The implications are enormous. Aside from the obvious issues raised by the possession by spooks of entry into your bank account, there are other, mundane, questions raised. What is all the fuss about money laundering if the government has, and has had, such access to the financial system’s records? Who is kidding whom here? You can read about the PROMIS story at the web site of Insight Magazine (www.insightmag.com) in a series of articles written by Insight investigative journalist Kelly Patricia O’Meara. For our own part, considering the number of US espionage cases in recent years, which often seem to involve the sale of software codes to foreign powers, we wonder about who else around the world has access to our bank accounts, and why? How the Money Works: West Philadelphia, Pennsylvania Georgie lives upstairs from my apartment on 54th street. She does not understand how her richest friend could now be one of her poorest friends, and what am I going to do about it. Georgie can’t figure out why the Department of Justice will not pay Hamilton for work performed and accepted by the government. I have explained that the Department of Justice says that the US is now money laundering $500 billion – $1 trillion a year. Such a volume would require significant pro-active leadership from the US Treasury, the Federal Reserve and the Department of Justice. Between the fed wire system and tools like PROMIS software, it is fair to say that the war on drugs is more about keeping the price of drugs up and the costs down than denying retail narcotics distributors access to our children. We drew a map of the US to demonstrate that the four largest state markets in drug import-exports, California, Texas, New York and Florida, are also the four largest states in money laundering and the four largest states in banking and investment. California, New York, Texas and Florida along with the law firms, lobbyists and government contractors in the DC area generate almost half of the national campaign contributions. Georgie said that looking at the big picture was simply too overwhelming and wondered how this could affect our block in West Philadelphia? So we got out a piece of paper and started to estimate. Daily, two or three teenagers on the corner deal drugs across the street. Georgie and I did a simple exercise. We figured that our three street dealers had a 50% deal with a supplier, did $300 a day each, and worked 250 days a year. Their supplier could run the profits through a local fast food restaurant that was owned by a publicly traded company. So those three illiterate teenagers could generate approximately $2-3MM in stock market value and a nice flow of deposits and business for the Philadelphia banks and insurance companies. Indeed, if the DOJ is correct about $500 billion – $1 trillion of annual money laundering in the US, then about $20-40 billion should flow at some point through the Philadelphia Fed. Assuming a 20% margin and a 20x multiple, the total feasible stock market cap pre-leverage could be as much as $80-160 billion. Imagine the stock market crash if all those black teenagers stopped dealing drugs and all these kids stopped taking them. What does this say about a society that we believe that a highly sophisticated multibillion-dollar financial business is managed and controlled by black teenagers, Colombian warlords and a few Italians? How is it that a military-enforcement complex with a $350 billion budget and a Federal Reserve system that controls the bank wire transfer system is helpless to stop them? What’s HUD Got to Do with It? Using government guarantees to insure mortgages in a neighbourhood like ours makes sense. It protects investors from concern about the value of real estate. The value of residential real estate reflects first and foremost the safety and well being of the neighbourhood. If West Philadelphia were financed with private mortgages from big Philadelphia banks, then they would lose money on the economic withering of neighbourhoods. If they pooled all the mortgages in mortgage pass-throughs and sold them to the pension funds without government guarantees of any kind, the pension funds would start losing money if defaults started to happen. For the banks, of course, it is impossible to refuse to make mortgage loans in a neighbourhood in which they are channelling the reinvestment of narcotics profits. First, there is the branding problem: they can not tell people they won’t finance their homes because they prefer to reinvest the profits of folks who sell narcotics to their children and they can not make money on both. That is a problem as well because the banks’ core business is based on using taxpayer’s credit, and moving the losses to the taxpayers when things go wrong. For large banks and corporations to extract equity out of a neighbourhood, it is essential that the local values not impair their assets or the mortgage securities they create and service. That is where government credit provided by agencies like HUD comes in. More money can be made from narcotics if the housing market has enough liquidity and the neighbourhood deposits come your way. So government guarantees ensure that (a) the taxpayer foots the bill and (b) the politicians can say that they are doing something to improve local housing conditions. The beauty of government credit is that banks and mortgage companies and investment banks can finance communities and not worry about whether the neighbourhood is safe or the schools are decent. Add the rich tax shelters and credits offered by Treasury and the subsidies from HUD, and who cares what the fundamental economics are? As an economic development consultant from Philadelphia said to me, “I don’t understand. I just had lunch with a guy from a large bank. They are financing housing that costs $150,000 per unit and selling it for $50,000. He says they are making a ton of money. How can that be?” I then explained what happens when you can create various combinations of tax shelters and tax credits and tax write-offs and tax exempt bonds and empowerment zones and mortgage pass-throughs with rich guaranteed financing and subsidies, all in no-risk packages. Investors such as pension funds, endowments and foundations do not even have to pay taxes on their income and capital gains. The beauty of the “don’t worry, be happy” model of financing communities with obfuscated taxpayer losses divorced from the economic reality of risk, is that everyone eventually buys into it. Local residents do not want the neighbourhood to get better because their rents or home taxes would rise and they would be forced out. Local small businessmen would lose their livelihood if commercial rents went up. Local organisations are increasingly dependent on government subsidies that they win by persuading someone that things are dire and people need lots of expert help as they — by some mystery — are unable to turn off their TVs and go down to the library or community college to get an education. Everyone adjusts to a perverse model: neighbourhood equity down, Dow Jones Index up, debt up, crime up. It is all because that is how his or her financial incentives have come to work. Meantime, the guys making all the money on the drugs take a small portion that they write off by moving it into charities and foundations. That means some of their principal can be invested tax exempt in perpetuity. Meanwhile the percentage of income that is spent for charitable purpose can go for a series of activities that keeps the bleeding hearts preoccupied. That way no one interferes with the fundamental issues and instead are preoccupied on token successes and systemic failures that help brand the donors as good and the poor as hopeless. And so HUD plays an important role in the transition of neighbourhoods in which all the players have a vested interest in the neighbourhood succeeding in the most cost effective manner, to one in which the players make money on failure or indifference. HUD has over $500 billion of mortgage insurance outstanding and an equivalent amount of mortgage securities backed up by the taxpayer’s full faith and credit through HUD’s mortgage agency, Ginnie Mae. Bubblemania Aside, 2 Plus 2 Still Adds Up to 4 There are two problems with federal investment in the US. The first is the imbalance between sources and uses. The second is that rates of return are negative. Let’s look at what is going on and why. In a nutshell, Washington is a financial mechanism that raises $1 from the American people and then invests $2 dollars back. If the politicians in Washington ask for another dollar to balance the equation, they are voted out of office. If they borrow another dollar to balance the equation, they are criticised soundly. If they cut spending by a dollar, they are again voted out of office. It is easy to see why the debt has gone up. In 1997, we did an analysis for a group of investors in the Philadelphia area. We estimated that the return on investment to taxpayers on total federal investment — subsidies, operations and financing — was negative. The majority of federal taxation and investment was lowering the Philadelphia share of the GNP. So the problem is not just that the government spends more than it taxes. There is an insidious shift from high return functions to low and negative return functions. The two dollars that Washington is spending is not generating four dollars or even the one-dollar that it is taking out for taxes. That means the local economy is losing five dollars from the proposition. Let’s look at this in the context of HUD. HUD has a program called Hope VI, which is the construction of new public housing. Here is how the money works on Hope VI. We tax people who make $36,000 a year. We then take the money and use it to build housing that costs $150-250,000 (inclusive of all overhead, etc) per apartment unit, which we use to warehouse people who make $10,000 a year or less in a manner in which they are unlikely to become taxpayers. This generates a large number of jobs, profit, and private equity for a group of lawyers, accountants, developers, consultants and others who tend to make substantially in excess of $36,000, say anywhere from $75,000 to $500,000 or more a year. In the HUD programs, a surprising number of them went to Harvard, Harvard Business School, the Harvard Kennedy School, and last but most special, Harvard Law School. If not Harvard, someplace more like it than the University of Tennessee agricultural school. A few years back I took the pricings on the HUD defaulted mortgage portfolio to the head of Hope VI. I explained that HUD had substantial single-family inventory in those same communities. Empty single-family homes could be bought and repaired at a fraction of the price of new construction of public housing by private developers. The HUD official said, “but then how would we generate fees for our friends?” You just have to love a woman who is that honest. The result of this situation is summed up by this statistic: twenty or thirty years ago, 70 cents of every dollar of federal spending went into the pocket of someone in the neighbourhood it was targeted at. Today that number is less than 30 cents. What that means is that investment in community development has enjoyed about a 300-400% increase in overhead, at the same time that technology has actually made it possible for overhead to drop dramatically The public policy “solution” has been to outsource government functions to make them more productive. In fact, this jump in overhead is simply a subsidy provided to private companies and organisations that receive thereby a guaranteed return regardless of performance. We have subsidies and financing to support housing programs that make no economic sense except for the property managers and owners who build and manage it for layers of fees. We have a horde of service providers to federal programs who are “expert” at helping communities of people who rarely show signs of improvement. At HUD, it is primarily defence contractors such as Lockheed, American Management Systems (AMS) and Dyncorp who run these same programs. Such companies tend to have numerous private conflicts of interest through companies owned directly or indirectly by their investors. They make money from the programs and serve as a revolving door for personnel between them and the government. Not surprisingly, they find it impossible to run HUD efficiently no matter how much they are paid. Incompetence is a moneymaker. Take AMS of Fairfax, Virginia, for example. It is reported to have earned $206MM since 1993 to build and run the HUD accounting system, HUD CAPS. That system has had mysterious periods of not working during which everyone was too busy to use a pencil and paper to reconcile the checkbook with Treasury. In fiscal 1999, HUD refused to publish audited financial statements. Total reported undocumentable adjustments to force balanced books in fiscal 1998-1999 are now $149 billion. When you see a company hired to operate financial control and accounting systems paid $206 million to mismanage or misreport $149 billion, you begin to appreciate the economics of bubblemania. One way to prevent such discrepancies would be to check that the revenues flowing out the door at HUD matched up with the revenues reported to the IRS at Treasury. This is a reasonable idea. However, today the head of the IRS is the former Chairman of AMS (who was provided with a waiver that allows him to keep his significant position in AMS stock). The truth is that the private sector is eating government programs and administration alive. This means that fundamental economic productivity is decreasing while government investment earns a constantly decreasing rate of return to taxpayers. This has been going on for a long time. For example, in 1988, I was invited to a budget briefing for business leaders by Secretary of Defence Weinberger at the Pentagon. For eight hours he and his corporate guests painted a clear and detailed picture as to how the top corporations in America would protect themselves during globalisation. This would be accomplished by substantially increasing the amount of cost-plus fixed price contracts they would be guaranteed from Washington. I had little appreciation then for what this meant Wall Street might be cooking up in the mortgage and mortgage securities market. How the Money Works: RTC and the Prelude to HUD Loan Sales In 1989, US financial institutions experienced a wave of single family, multifamily and commercial mortgage defaults known as the Savings and Loan crisis. The resolution of the so-called S&L crisis saw the development of the Resolution Trust Corporation (RTC). The RTC was a mechanism by which the American taxpayers underwrote approximately $500 billion of waste, tax shelters and fraud in a manner that allowed the investors to buy the assets at a discount. Two of the biggest winners were the large banks that were bust but did not go bust and the large banks that were not bust who enjoyed the ride. The former were floated out by a nicely upward sloping yield curve thanks to Alan Greenspan, Federal Reserve Chairman. The Fed pumped Citibank out of a negative equity position with royal amounts of federal credit arbitrage. Citibank could borrow short and reinvest long at a 500 basis point spread and just keep doing it until it had generated sufficient profits to comply with its regulatory requirement for equity capital. In the meantime, NationsBank and those who started with positive equity positions were having an even better time. Congress never discussed or voted on it. In 1993, I had lunch with the head of corporate lending in the DC area from NationsBank. He explained that NationsBank had no plans to make small business loans of any meaningful volume in the district. I had checked their latest SEC filings that morning. NationsBank had approximately $110 billion in long treasury bonds on their balance sheet. Essentially, the American taxpayers were providing them with the mechanism to borrow short term at a low price using our credit, collect up all our deposits using our credit, then lend to our government long term at a 550 basis point spread where they had a recourse guarantee of our credit, and refuse to lend to my small business since it was not good enough business for them. The net result was that I could finance my government handing out more subsidy and credit to large corporations while I financed my small business with my credit card, paying them 18% to borrow my money provided with my credit and deposits. As a board member at Sallie Mae at the time, I also got to see firsthand how the Government Sponsored Enterprises were doing. About a third of our balance sheet at Sallie Mae was borrowing short to invest long in what was essentially the same federal government credit arbitrage. It appeared that Freddie Mac and Fannie Mae were doing the same thing. What we were creating was a society in which certain institutions were not only not allowed to fail, but were guaranteed profits using taxpayers’ credit. The best part yet was that every time the taxpayers and their credit bailed these folks out, they and their investors got to keep 100% of the equity. So heads you win, tails you stick the losses to the taxpayers. Large banks are not allowed to fail. This set the stage for a long series of taxpayer financed rescues: the Mexican bailout, the “restructuring” of Russia, and the Long Term Capital Management bailout. A Word About Place-based Financial Disclosure When I joined the Bush Administration in 1989 as Assistant Secretary of Housing, I read the budget for the Federal Housing Administration. It described a $300 billion portfolio of mortgage insurance with about $50-100 billion a year of annual originations. I asked the person responsible for the comptroller function to direct me to the place in the budget where it explained how much we were making and losing. I was told there was no such place. I asked where the financial statements were. I was told that the accountants had them, that they reported to a different Assistant Secretary and that I was not allowed to speak with them. The Government Accounting Office (GAO) had audited our financial statements several years ago. We could not afford an outside auditor, let alone every year. Besides, we operated on a cash basis. The Office of Management and Budget (OMB) would never permit accrual statements. After months of working with a variety of parties at HUD, OMB and in the Administration, and with much support from GAO, the accounting group was moved over to my area and legislation was introduced and passed that required a comptroller for the FHA Funds, a chief financial officer for the department, and a legal requirement for annual audited financial statements and actuarial statements. When we got access to our financial information, it turned out that we were losing $11 million a day in the single-family fund, the Mutual Mortgage Insurance Fund, and more in the multifamily and special risk fund called the General Insurance Fund. What is more, I discovered that we had never tracked our financial results on a place-based basis. In other words, ten regional and eighty field offices had no idea how they were doing. So we put together crude place-based cash flows. What we found was simply astonishing. First, the national data on which the portfolio was based turned out to be the irrelevant product of averaging. A look at all ten regions and eighty field offices showed that no one part of the portfolio fit the image depicted by the national averages. Our vision of our business had been substantially distorted by the way in which the data had been presented. Second, it turned out that over 100% of our losses were generated in two regions. The first was headquartered in Texas, and included Oklahoma, Louisiana and Arkansas. We discovered that the Texas region had lost over $2 billion the year before. They had no idea. The second was headquartered in Colorado. What the numbers showed was that S&L fraud and HUD fraud were perpetrated by the same networks and in the same places involving the use of federal credit. Meantime, back in Washington, everyone was talking about these two scandals — the S&L scandal and the HUD scandal — as if they were separate. It was clear that place-based financial data would have told us what had happened, who had profited and how to prevent it from happening again. It also became apparent that our investments in communities conflicted with the other federal, state and local investment in that place. There was no mechanism to optimise total government investment and operations within a place. Federal spending seemed intentionally designed to insure that there could be no flexibility between categories. We were spending $55,000 a year for a woman and 1.8 children to live in a place and in a manner such that they would and indeed could never become taxpayers and get off the dole. We were spending $150-250,000 to build public housing while HUD foreclosed homes that could be bought and fixed up for $50,000 were available a block away. We were paying large corporations $35-150 dollars an hour to do things that people who lived in those neighbourhoods could be trained to do. The implications were enormous: theoretically, at least, there was the opportunity, using more accurate place-based information, to place public finances on a sounder footing in which the tax payers’ investment returns were positive. Therein lay a problem however, because there was no political constituency for place-based financial statements. Return on investment to special interests was not compatible with a positive return on investment to taxpayers. There were two kinds of special interests. The first were technically legal. The second were illegal. The second was growing. My refusal to follow illegal orders and success at cleaning up Iran Contra fraud ultimately led to my leaving the Administration in 1990. I was told the day after I left that the preparation of place-based financial accounting and statements had been terminated. That was one of the reasons I turned down the opportunity to serve at the Federal Reserve and instead started Hamilton upon leaving the Bush Administration. It was the reason why we at Hamilton built Community Wizard. 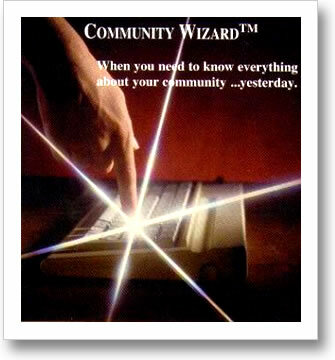 The Community Wizard made it possible for anyone to put together a sources and uses statement for government activities (taxes, time use, spending, credit, regulation, operations, and more) in their community. An easy step was just linking to the Consolidated Financial Reports (CAFRS). The shock of finding so much in the way of hidden assets and where the money was really going was always a pleasure to watch. Why should the finance committee chairmen of the political campaigns be the only ones to see the information on how the money works by place? Luis Mendez, one of my partners at Dillon Read, visited me in Washington in 1996. He said that Wizard was a stupid idea that would not work. Things were hopeless, he said. I showed Luis a printout of the CAFR for his community of Bronxville, New York. When he saw the figures, he exploded in rage. The first item was $4 million of flood insurance. This was the worst form of corruption, Luis said. Apparently, Bronxville was on a hill. The next day Luis spent two hours on the phone with the Deputy Mayor of Bronxville going through each item and informing him this was all going to stop. Apparently, things were far from hopeless, once one had the information. It just took one good map to see how to fix thousands of little things, one at a time. How the Money Works: HUD Loan Sales As non-performing mortgages cascaded into the RTC and private financial institutions in the late 1980’s and early 1990’s, auction markets in those loans developed. There were a wide variety of buyers — real estate investors looking to get control of properties, mortgage brokers buying and selling whole loans and securities firms looking to pool mortgages and issue new securities in the pools. The technology of mortgage workouts boomed. HUD was the only major financial institution that stayed on the sidelines and simply let its portfolio grow, until by 1993 it had approximately $4 billion of performing and non-performing single family mortgages and $8 billion of multifamily mortgages. The cost of holding these mortgages in portfolio was substantial. The cost to nearby homeowners and residents was also substantial as homes sat empty and foreclosed or apartment buildings in need of workout went unattended. As field offices were overwhelmed, contractors were hired to help service the various portfolios. As the portfolio and losses grew, so did their business. And so did the criticisms. The HUD Inspector General criticised HUD for not having a loan sales program and the large portfolio of defaulted mortgages was listed as a “material weakness” by HUD’s outside auditor and the OMB. This mess on the back end of the lending and borrowing process was also shutting down the ability to continue origination volume on the front end. Credit reform legislation passed during the Bush Administration was designed to prevent S&L type scandals happening with the $1.2 trillion of federal credit, of which HUD mortgage insurance as about one third. In addition to requiring annual financial statements and actuarial statements, new originations required loan loss reserves funded through appropriations. In 1993, the Clinton Administration’s plan to issue lots of mortgage insurance faced a funding problem. High default rates on the mortgage insurance portfolio and low recovery rates on the defaulted mortgage portfolio had serious implications for the cost and volume of new originations. That meant that the pressure was intense to substantially improve the recovery rates. At the end of 1992, HUD issued a competitive request for proposals from contractors to improve loan loss recoveries, a competition that Hamilton won in late 1993 due in part to the total disinterest of the financial advisory industry. The experts were confident that HUD could never successfully put into operation debt servicing options, including auctions. While we shared the widespread assessment of the difficulties of getting things done, HUD’s pool of data — the richest data on how all the money worked by place — was a significant attraction. I also wanted to prototype the reengineering of government and private investment by place. HUD afforded a rare opportunity to transfer substantial amounts of assets to the private markets in a way that would encourage equity-based financing of communities — moving communities to a healthier and more productive economic basis. Hamilton sought to prototype the Community Wizard, through which the integration of new technology combined with the privatisation of government and the securitisation of the illiquid economy could create the greatest wealth. Low cost access to due diligence databases and packages and forward auction calendars, through the Internet, the World Wide Web and proprietary on line systems. Optimisation bid technology adapted by AT&T Bell Labs from their original technology used to route telephone call and airline flight crew schedules. This allowed bidders to stratify the portfolio the way they wanted to. It dramatically increased competition between all sectors of the real estate, mortgage and securities market, both large and small. This also allowed HUD to calculate the performance of numerous groups of bidders and the financial costs of less attractive measures. In short, the facts were at hand for the first time. The process was improved through adaptation of software development models to bid design and management by HUD. Auctions were designed on line through the creation of detailed design books owned by the government that allowed for much more precise communication and agreements between numerous parts of the government. This instilled accountability and clarity in a highly political environment — as well as radically reducing transaction costs and the ability to ensure that HUD was not dependent on a handful of contractors. Loan servicers were losing contract business as the defaulted portfolio decreased. The enforcement teams in the Inspector General’s office and General Counsel’s office, which generated revenues for the government through civil money penalties on the defaulted portfolio, were unhappy. While they admitted that sales were better for HUD, they took the position that they were worse for their performance goals. Their message to the program staff was, in essence: to hell with the taxpayers, we only care about our stuff. Property owners complained loudly about no longer getting below market workouts at 35%, and alluded to “special deals” they had been promised that loan sales now violated. Harvard Endowment’s NHP was the most vociferous and aggressive in their lobbying against the loan sales, working through the National Association of Homebuilders and the National Multi-Housing Council. Given how many people from Harvard populated the key political appointments at Treasury, OMB, DOJ and HUD, including the lawyers who ran the real deal behind the protection of attorney-client privilege and a maze of secrecy laws, this was a concern. Bob Rubin, Secretary of the Treasury, had been on the board of Harvard Endowment. His deputy, Lawrence Summers, had been a professor at Harvard (and would return as President in 2001). The current Harvard Endowment board member involved in Harvard’s HUD investments, Pug Winokur, was also the lead investor in and Chairman of Dyncorp. DynCorp was one of the leading military and intelligence agency contractors in the War on Drugs with contracts at DOJ, HUD and the State Department. DynCorp had a vested interest in neighbourhoods not working. DynCorp was one of the managers of the PROMIS system at DOJ and the lead contractor on DOJ’s Asset Forfeiture Fund. Optimisation study results showed that the traditional HUD property managers and bankers were substantially under performing the bidding groups, coming in 25% or more below the winning bid levels. The message to everyone at HUD was that the absence of open disclosure and competition in their programs had cost them dear. If HUD applied the principles of disclosure and competition to new allocations of subsidy and credit, Harvard would be one of the larger losers. Owners, general partners and limited partners in HUD-subsidised portfolios anticipated an immediate renewal of their subsidy contracts. If the principles of SEC standards of disclosure and competition were applied to them in the future, they could face tax recapture and potential securities fraud liability. Other HUD contractors — HUD is essentially run and controlled by a group of defence contractors — appeared concerned that Hamilton’s financial software and portfolio strategy tools gave political appointees too much knowledge of how the money worked at HUD. This would harm their purpose and the profits of their networks. Lockheed and EDS personnel regularly made it difficult to access databases that they managed for HUD. While the loan sales were an improvement over doing nothing, they represented only a first step. The loan sales had improved recovery rates from 35% to 70-90%, generating several billions of savings. However, there was still more room for improvement. The direction in which the loan sales and the portfolio strategies were being developed created some political problems. Simple auctions gave the advantage to bidders that were bidding with “hot money”. So, arguably, the narcotics trafficking operation that had undermined neighbourhoods in a way that resulted in a mortgage going into default, had the money to bid the most aggressively on the auction. HUD was moving to organise its bids on a place-based basis and to establish trusts in which the winning bid and performance was measured in terms of total savings to the government, not just to HUD. Such structures, once successfully prototyped and developed, would have produced a far better return for both government and the community. It would counter balance the hot money problem by providing local players with a way of outperforming national players. Auctions held regularly from the field offices could move portfolio faster in a way that could help mitigate the deterioration in value while the mortgage was held in portfolio for national auctions. There was a direct conflict between the interests of both taxpayers and community homeowners and residents on the one hand, and the interests of various intermediaries and special interests on the other. Decades of inertia had created a significant infrastructure of people who made money from managing poverty-not ending it. This infrastructure included contractors, property managers, not-for-profit institutions, mortgage bankers, investment bankers, consultants, state housing finance agencies and low income activists who made money from the average American not having access to education, jobs and capital based on performance. Performance was judged on the return on investment to special interests, not the return on investment to taxpayers. The two had devolved to a point where they were pitted in a win-lose relationship. On the face of things, the loan sales were a grand success in the capital markets, in the technology world, in the reengineering world, and to the bottom line. Behind the scenes they were unhelpful for the Democrats who had to raise money in the 1996 elections and to the Republicans who were putting forward Jack Kemp, the former secretary of HUD. Everyone needed more pork and patronage to hand out, not less. HUD was a slush fund. Some say the loan sales were initially used to increase slush fund resources. If Treasury colluded with Wall Street bidders, it is entirely possible to have stolen large amounts of resources without anyone on the HUD loan sales team knowing. In addition, loan sales generated the credit subsidy and high recovery rate assumptions needed to fund large increases of new originations. Were new originations needed to keep slush fund operations going? If so, once enough credit subsidy profits were generated to fund new originations, Wizard and the place-based trusts may have exposed slush fund operations. In the end, HUD decided to resolve its ongoing single-family mortgage defaults with a foreclosure process that rejected resolution methods that could produce a 90% recovery rate. Instead, it chose a foreclosure and inventory property sales system that had historically produced 35% recovery rates. It was much more expensive for both defaulting and nearby homeowners, costing the HUD mortgage funds in the billions annually. The justification given by the deputy in charge of the single-family program was that maintaining a large foreclosed property inventory was essential to being a “full service real estate operation.” Losing billions a year so that a government agency is “full service” is bureaucrat-speak that intentionally obscures other objectives. Proof lay in the silence of the private mortgage insurance companies and the mortgage industry. These practices were fine with them. When the private sector concedes large market share to government graciously, something is up. The National Security Council’s Point of View I used to have a partner who would always say, “Cash flow is more important than your mother.” If you want to understand anything, sit in the top guy’s chair and simulate the cash flows. Everything becomes very clear quickly. Put yourself in this man’s shoes: It is 1996, and you are the Secretary of the Treasury, Bob Rubin. Your job is to keep the stock market up and the deficit financed. While you would like the economy to be good, the reality is that you need the profits and capital gains of the men who run all the money to be healthy and for their reinvestment to cycle back through your financial system’s pipeline. To do this, you are dependent on the $500 billion to $1 trillion per annum of money laundering that passes through the American banking system as estimated by the Department of Justice. To get a proper idea of the importance of this flow to the banks that are your charge, imagine for the sake of example that the banks earn fees and commissions of 1% on those volumes. (Considering that the source of that money is illegal, 1% is almost certainly too low.) That amounts to $5 to $10 billion in pre-tax profits. Clearly, you need that number to grow. You need worldwide capital to move through your pipelines. One way to keep that flow growing is with government credit. Government credit supports the capital markets and prospective capital gains from those markets attracts more money. The growth of federal and federal supported credit was simply stupefying during the 1990’s. Republicans and Democrats tripped over each other in the competition to slap out ever more. Another way is to run your enforcement, intelligence and military operations to consolidate the money laundering market and overall capital flow into those financial institutions that cycle the deposits and investments though the US financial markets. If you were Bob Rubin and the members of the National Security Council in 1996, you would have felt the pressure to keep the cash flow that comes through your pipelines growing. There was an election to win. The1996 Presidential campaign was an unusually partisan one. The competition for fundraising was intense — involving lots of alleged money laundering schemes that tied into money abroad. Needless to say, the nostrum “it’s the economy, stupid” that informed the 1992 Democratic campaign and victory still held. That meant that for the incumbents to win, the stock market needed to be high and interest rates and gold prices low. With substantial fundraising coming from the states (New York, California, Texas, Florida and the DC area) representing the highest money laundering flows, the reality of raising money was brought home by ex-CIA chief William Colby’s statement in 1995 that the drug cartels may now be calling the shots at all levels of government. Rumours abounded about money laundered into campaign coffers from government credit and deals extended to Russia and China. From the NSC’s Point of View: What Does HUD Have to Do With It? Let’s look at HUD from Rubin’s point of view. First, global money laundering and capital attraction is a lot easier with federal credit. No one needs to bother about credit quality, and it is readily marketable around the world. A significant amount of federal credit, whether on balance sheet through HUD, VA or Farmers Home, or off budget through FDIC and the GSE’s, backs the US mortgage finance system. It may seem counter intuitive to imagine that federal credit could be a vehicle for money laundering, but in reality it is simplicity itself. It is well explained in Gary Webb’s book, Dark Alliance. It was published in 1998 after he was fired from the San Jose Mercury News for publishing the expose of the same title in 1996. In it, Ricky Ross, the dealer who led the crack cocaine explosion in South Central Los Angeles, explains to his Iran Contra supplier that he has a cash problem. The problem is that he has millions in cash underneath his bed and it just keeps growing. What can he do with the cash? The supplier says, “Don’t you know, you buy real estate.” So Ricky bought a string of properties. He wasn’t alone. Some estimates of the volume of Florida real estate transactions funded by illicit cash are as high as 70%. The lesson is clear. Publicly traded homebuilding and mortgage banking operations can be both a turbo-charged cash and capital gains machine. As of 1996, homebuilding and mortgage banking was unimpeded by any money laundering enforcement. I then visited the vendor fair. All the software providers who helped banks comply with money laundering regulation said that their banking clients would not let them near their mortgage banking subsidiaries, which were booming. A visit with the Lexus-Nexus affiliate indicated that the only reference he could find to money laundering enforcement in US homebuilding and mortgage banking indicated that HUD was the responsible enforcement authority — which means there was none. The NSC’s Point of View: The Dark Alliance Allegations Another one of Bob Rubin and the NSC’s problems in 1996 was that the information regarding government narcotics trafficking kept seeping into the public awareness in a manner that could impair essential narcotics trafficking profits and reinvestment thereof. Government deficit financing both in the US and worldwide had for decades depended on an ever-expanding illegal narcotics trade. Narcotics had been a banking business from the beginning, controlled for the benefit of those who wanted large pools of deposits to finance new investments or to take in payment for trade from those who could not access credit. As head of the arbitrage desk at Goldman Sachs for many years, Rubin would have seen the process by which organised crime profits, cycled through Wall Street, bought up corporate America through mergers and acquisitions and leveraged buyouts. This was a game he must have understood. The NSC’s Point of View: Missing Money and Slush Funds One of my accomplishments in the Bush Administration was to persuade the Office of Management and Budget to allow us to create a legal requirement that HUD and its component parts have a Chief Financial Officer (CFO) and audited annual financial statements with actuarial studies, and then to require it of all the other federal credit programs. After we won OMB’s support, the notion of CFOs, accrual statements and outside audits caught on all round the government. One of the reasons the “missing money” problems have come to the fore is that GAO is continually announcing that such and such an agency can not produce audited financials as required and the amount of the adjustments without documentation it requires to get the agency and the US Treasury to agree is such and such. In March 2000, the HUD Inspector General testified that HUD would not publish financial statements for fiscal 1999 and that the undocumentable adjustments made so far to balance the books was $59 billion. A close reading of the undecipherable preliminary audit indicated that, in fact, the number was $17 billion in fiscal 1998 and $70 billion on the asset side and $59 billion on the liability side in fiscal 1999. As a practical matter, since HUD was assuring us that their systems did not work and that they had simply not bothered to check their accounts and cash balances in the old fashioned way using paper and pencil, we had no numbers of any meaning. In fact, anything was possible. Worse yet, GAO reports of the Treasury accounting systems — both as to their reliability and control by private contractors — are also disturbing. With little or no “info-sovereignty”, the internal controls are insufficient to assure that cash balance reconciliation between an agency such as HUD and Treasury are accurate. When an agency can issue government guarantees and not record what they have issued correctly and then write checks that are not recorded correctly, then one or more of the players that handle the money, namely the US Treasury, the Federal Reserve Bank of New York, AMS and Lockheed, may be in a position to steal literally hundreds of billions of dollars with no one the wiser except those enjoying the fruits. Such a thought seemed far-fetched not that long ago. Indeed, in 1994 after the first FHA/HUD financial audit was published, a mortgage banker came to see me. He was a serious engineering type who clearly worked hard and mastered the details of his business. He was distressed, he said. For decades he had been keeping a tally of total outstanding FHA/HUD mortgage insurance credit. He had brought printouts of his database for me. It turned out that the government’s published financial statements showed the amount outstanding was substantially less than the actual amount outstanding. He was sure. I assumed that the guy was crazy. If what he said were true, then the US Treasury and the Federal Reserve would have to be complicit in significant fraud, including securities fraud. This was inconceivable. To this day, I regret not accepting a copy of the printouts from his databases. I wonder if they might have illuminated what our Wizard and other portfolio tools were about to find. They might have helped explain why our efforts to distribute information on the HUD outstanding mortgage and defaulted mortgage portfolios inspired such opposition and distress. The indications are growing that Treasury and OMB are engaging in fraudulent transactions and that the key financing, accounting and payments systems are run by contractors who are either in on the deal or turn a blind eye. What this means is that the financial disclosure provided by the federal government may be essentially meaningless. It does not take long to realise that in a world with no financial controls — with the fox in control of the chicken coop — anything is possible. Life in the federal government is an endless series of shortcuts under impossible political stress and risk. With no internal financial controls, things can go far off course with no way for reasonable people to stop it. HUD is being used to finance covert intelligence and military operations and research projects both domestically and globally. Some of this funding is “black budget”; that is, it is not disclosed to or approved by Congress. That means it is in violation of the US Constitution. State and local housing agencies that are used as local managers and distributors of HUD mortgage credit and subsidies are part of the money laundering chain. Allegations regarding the Arkansas Finance Development Agency, ADFA, give examples of how this works. One of the mechanisms used to provide slush fund monies is with mortgage securities that are created in whole or in part with fraudulent mortgages. Churning mortgage defaults back through HUD supports debt service. The HUD loan sales were used to launder money from abroad back into the Treasury’s Exchange Stabilisation fund (ESF). PROMIS software was used by winning bidders — to help them submit winning bids. Slush fund monies were used to fund the Treasury’s ESR’s funding of Swiss reparations to the Jewish victims of Nazi seizures. While it would be nice to learn the truth of what fraud, if any, has transpired, what is important is to get our tax dollars managed properly and if money is missing, get it back. Scandals and blame games are not as useful as getting a proper system of resource management in place and recovering any stolen money. For three years now I have listened to descriptions by retired military and intelligence folks about why so much money has gone missing at HUD and HUD’s role in a series of slush funds around the government. The reality is that I have no idea what is true and what is false, what is information, what is exaggeration, what is misinformation and what is disinformation or incompetence. I am simply not qualified to say. What I do know from twice trying to help run HUD on a financially responsible basis is that what they are saying is compatible with what I have experienced over the last twelve years. Nothing that I have experienced would indicate that their allegations are not feasible. I am convinced that some combination is true. Based on the documentary evidence, that is absolutely correct. Catherine Austin Fitts is the President of Solari, Inc, an investment advisor created to invest in equity managed by solaris, investment databanks and investment advisors for places of up to 10,000 people. 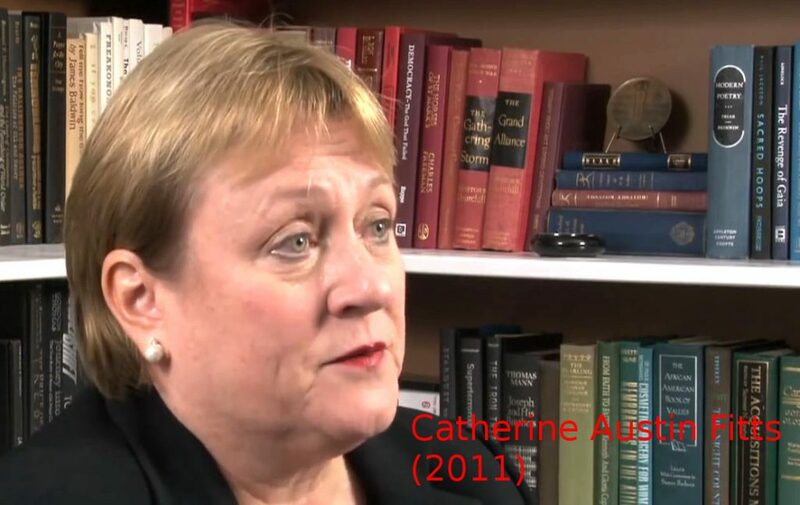 She is a former Assistant Secretary of Housing-Federal Housing Commissioner in the first Bush Administration, a former managing director and member of the board of Dillon, Read & Co, Inc (now UBS) and President of The Hamilton Securities Group, Inc. Catherine provides risk management services to investors through Sanders Research Associates in London. She writes “The Real Deal” column for Scoop Media New Zealand.